Whether I can do all the prep work and primer etc at home and send it to just get top coated at a paint shop? 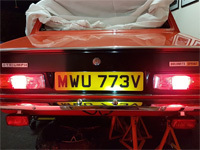 I'm a bit confused as this article http://www.classicbritishcars.online/re ... the-cheap/ is pretty recent and seems to say it would only cost £600 ish to get it painted with me doing the prep work, but other forums go as high as £7000! Your car is carmine red so looks to be well oxidised and looks flat. Carmine is not nice paint in that original form. You really need to flat it all off and then isolate and repaint in 2k. I cant see you getting back to bare metal without far too much work and cost. Others will disagree....it depends on how much work and kit you can invest. I've removed your test post. If you can, take it back to bare metal especially if the paint history is unknown. Another advantage of going back to bare metal is that you will uncover any damage, rust and previous repairs. You can then sort them out before you paint. Isolator will prevent any reaction with existing paint. Remove as much of the trim as possible for better results. 2K isn't really a DIY proposition so cellulose will be your paint type of choice. You will need a compressor and a spray gun. It won't be cheap but it is a lot less than a professional respray. Is "Florence" a reference to a certain band by any chance? Yes I think the car is named after the band Thank you for the advice on paintwork, I think I will go for celluloid in the end. Unfortunately I'll have to put paint off for a while, I was driving the other day and a very loud ticking/grinding noise came from the engine, I had to pull off the motorway and at a traffic light it stalled. After starting up again it was much worse, louder and a real dragging feel like the handbrake was on, and after getting it to a car park I saw loony tunes levels of white smoke coming from the exhaust.I checked the oil and water which were fine,let it cool down for 40 minuets and started it up again to the exact same result. A couple of starts later it started coming out from under the rocker cover with a big bang as well. It got towed home and doesn't seem too bad now when I started it up on the drive, a lot less white smoke coming out the exhaust/ sometimes none but I'm not convinced and worried the whole unit will need reboring or something else expensive, not great considering the 1500 engine seems to be the worst engine in the dolomite range and not really worth spending money on. Im going to try tuning it (it was lumpy in low revs when I bought it, it didn't idle for very long before stuttering and stalling) and will replace the spark plugs which were very oily, the other option I thought of was switching it out with a MX5 engine and gearbox.For lots of other cars there exist restoration guides but I couldn't find one on the dolomite, does anyone know of any or something close that can be helpful? also in relation to 2k paint, i got a quote from a local paint shop for £300 to paint the topcoat in 2k paint, but that was just for the top coat (not clear coat as well), didn't include the paint (id have to buy that myself for whatever reason) and id be doing all the prep and masking up myself. They were also keen to stress they wouldn't be responsible if anything went wrong and the car came out looking awful. Oh dear, this isn't good. White smoke points to a head gasket failure but I reckon you've got other problems besides. At the very least, the cylinder head will have to come off. A replacement engine is probably the most cost effective option to get you going again. Hope you can get it sorted. We're here to help so get asking those questions. i got a quote from a local paint shop for £300 to paint the topcoat in 2k paint, but that was just for the top coat (not clear coat as well), didn't include the paint (id have to buy that myself for whatever reason) and id be doing all the prep and masking up myself. They were also keen to stress they wouldn't be responsible if anything went wrong and the car came out looking awful. Yes for £300 it will look awful. Why would someone quote you to do half a job? What they are telling you is no we're not interested in painting your car. updates, I cleaned the spark plugs a bit and tried them again. The white smoke is back in big plumes, having taken the rocker shaft off you can see it coming up from the connecting rods. if its just the head gasket that's gone. gasket has to match. If its been done recently that could well be why its gone now....wrong h/g. Oh dear; sorry to read about this. That is a good photo of the white smoke. Have you noticed how its hanging in the air ? That looks more like oil smoke sadly. ( Water vapour disperses quickly ). Its burning a lot of oil . Couple that with the fact that smoke is coming out of the push-rod holes means its probably burning in the cylinder and then getting down into the crankcase and then up into push-rod holes. So that, with the fact that pot no 3 has low compression I reckon means there is a hole in no 3 pot. Don't worry, it's all fixable. Get the head off and put up a piccy of what you find. If it is on the original sills then the drain holes will be blocked. The end of a cable tie is perfect for unblocking them. Did you follow the link I posted to my BT Cloud? There's all the parts catalogues and BL factory workshop manuals available to download. There's also a Sandard-Triumph Hardware Catalogue which lists all the various fixings (nuts, bolts, screws, etc) which can be handy if you need to source replacements from a nut & bolt place. If you think the Haynes ain't all that great you should see the ones for the modern cars. They're not any better. I managed (with loads of help from my dad) to get the cylinder head off. The exhaust manifold has some really inaccessible bolts so I'm not looking forward to reinstalling that, I had to take the carburettors off the inlet manifold just to access them with a socket. I took ages so by the time I'd washed my hands to take pictures it was dark, Ill be sure to take more in the morning.